Windows Live Messenger, which is also called MSN Live Messenger or just MSN, is one of the most popular instant messengers for the Windows operating system. This makes it a target for all kinds of malicious software and spam. WLM Safe has been developed to specifically protect the Windows Live Messenger from these threats. * Anti-Virus: detects and blocks infected links sent by virus in conversation windows. * Anti-Phishing: detects and blocks phishing links sent by virus in conversation windows. * Anti-Spam: blocks annoying spam messages sent by your contacts. * Anti-Flood: detects flood attacks and block the authors. * Anti-Freeze: block messages that make old messenger’s versions crash. * Anti-Copy: notifies you if one of your Messenger’s contacts copy your Nickname. * Anti-Bot: notifies you if you’re chatting with a Bot. * Anti-Hackers: notifies you if you’re chatting with an Unsafe contact. The security program for MSN Live Messenger comes with several additional functions that might be useful for some users. It is for example possible to reduce the memory usage of the program, clean its cache or take a look at all processes of the operating system. Other options include locking MSN Messenger from being used by other users and to prevent the uninstallation of scripts in the instant messenger. Expert users might be able to live without most of these modules while beginners might be best protected if they enable all of them. 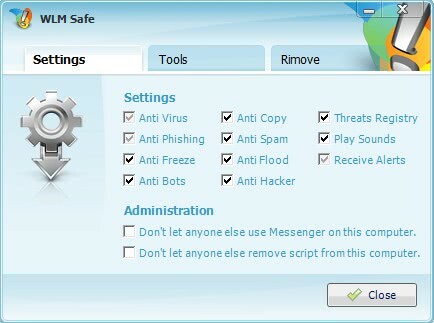 WLM Safe is an interesting security program for Windows Live Messenger.